Who, really, is Maggie Haberman of the NY Times? 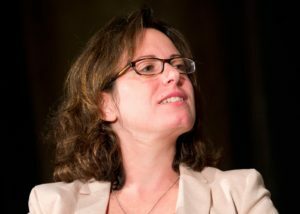 Maggie Haberman, currently of The New York Times and formerly of Politico, has gained a reputation as the go-to reporter for Democrats looking for positive spin. In her new book “Smear”, former CBS journalist Sharyl Attkisson now with Sinclair Broadcast Group describes how Democratic operatives use friendly journalists to skew coverage. Haberman expressed utter shock at last week’s revelation that Hillary Clinton’s campaign and the Democratic National Committee (DNC) paid for the bogus Trump dossier. “Folks involved in funding this lied about it, and with sanctimony, for a year,” Haberman tweeted. Shocked? Conservative bloggers waxed sarcastic. But then, Klavan adds, “Haberman says the relentlessly left-wing, anti-Trump Times has no bias whatsoever. ‘I think we try and play this straight down the middle,’ she says.